In the early 1990s something exciting happened. In fact, it was a combination of both things: something exciting and something happening. It was the publication of Timothy Zahn’s Admiral Thrawn trilogy. It was set not long after the Rebel victory at Endor and focused on the threatening appearance of a previously unknown blue-skinned Imperial admiral who was prepared and seemingly able to crush the New Republic before the new car smell of the galactic government had even been deeply inhaled. The three books of the trilogy ignited an explosion of media to write and discover the story of our heroes from the Original Trilogy after its conclusion. Years passed within this new expanded universe and without, readers grew along with their favorite characters, and everything from children being born to turning to the Dark Side to everyone’s most beloved Wookie dying unraveled upon the printed page. The success of the expanded universe undoubtedly played a role in George Lucas’ decision to return to the cinematic Star Wars universe, and that endeavor, for as much as any one fan loved or loathed it, likewise lead to the surprise business transaction of 2012 when Disney purchased Lucasfilm. Overnight the control of everything Star Wars shifted hands and one of the largest, if not the largest, entertainment businesses in the world examined their new acquisition and made a momentous decision. It decided to essentially scrap the nearly two decades old expanded universe in favor of resetting the clock. The old expanded universe material, the Thrawn Trilogy for example, were labeled “Legends,” and a blank slate was drawn up with only a few existing properties identified as the new canon: the Original Trilogy, the Prequel Trilogy, and the CGI animated Clone Wars television show. Under the banner of cinematic production, Disney also announced that it would move forward with a new trilogy, one set after the Original Trilogy. Truly, the trilogy of films that most fans had wanted since the screen cut to black over the celebratory party end of Return of the Jedi. The details that followed are now well known and on December 18, 2015, Star Wars: The Force Awakens will premiere. For those familiar with the early additions to the old expanded universe which took place after Jedi, the first few books almost exclusively focused on the same heroes we championed throughout the Original Trilogy, Luke, Han, and Leia, along with Chewbacca and our two favorite droids. For those expecting the same with Aftermath, they will be disappointed. None of the main characters from the Original Trilogy are given ‘screen time’ with the brief exception of Han and Chewie. Other familiar names flirt on the periphery of the story, Ackbar, Mon Mothma, and General Madine. Aftermath, however, it is not their story, but the adventure of a new group of heroes and the initial efforts of some of the most powerful power brokers yet alive within the former Galactic Empire to salvage the Empire in the wake of its greatest defeat. It’s appropriate that Return of the Jedi is our last reference point entering this adventure, as three of the major new characters all have a connection to the Battle of Endor. One is a former pilot for the Rebellion, Norra Wexley. She was among the few Rebel pilots who flew into the half-built Death Star along with Lando Calrissian, and among the fewer who flew out (she piloted a Y-wing). A hero of the battle, and a bit traumatized by the experience, Norra is in process of returning to her home planet of Akiva, to find her son and to start a new life with him somewhere far away from the memories of war. Akiva is also our main setting for Aftermath. Located in the Outer Rim, a favorite location for many of our Star Wars stories, Akiva is nearly as much a backwater as Tatooine, but definitely moister. Set principally in the planet’s capital city of Myrra, the location decades earlier for a Separatist droid factory, Akiva is inhabited by a mix of races and ruled by a local satrap with a long tradition of working arm in arm with the Empire. In its darker, smellier places, it boasts its own crime lord, a Sullustian named Surat Nurat. Surat has few challengers, but from the start of the novel, a thorn in his side emerges in the form of a fifteen year old human named Temmin. Temmin is also Norra’s son. Out Norra’s former house, Temmin runs a junk shop which also serves as something of a cover for another business, an illicit business, which he hopes to expand enough to someday wrest control of Myrra’s underground from Surat. Temmin seems to be inspired by the idea of young Anakin working in a salvage shop and mechanically gifted enough to build his own droid, but never having Force powers and Watto kicking the bucket. Temmin has built his own droid, or rather, a reconstructed battle droid (think of the ones which always go, “Roger, Roger,” and were virtually useless against any competent foe in the first two Prequel Trilogy films). This droid, however, is a bit more lethal. Named Bones and loaded with a number of programs to enhance its combat usefulness, it’s also a bit deranged. Needless to say, it does a lot of killing. Killing is also the profession of another of our main characters, Jas Emari, a bounty hunter on a mission to take down a powerful Imperial in Myrra. Jas is a Zabrak and one might conjure up an idea of her appearance by thinking of Darth Maul, but one color and no yellow eyes. Jas is a lesson in practicality and relentlessness, not to mention, extremely dangerous. It’s only when she believes someone is worthy, does she even consider getting intimate with them. She, too, was present at the Battle of Endor, sent on a mission to kill Princess Leia, stopping only when the second Death Star exploded in the sky above – she figured the Empire was no longer good for the payment. Yet, she was not the only one in the realm of the ewok that day. The other was Sinjir Rath Velus. Sinjir is a former “loyalty” officer of the Empire. Tasked with the duty of weeding out those who held less than firm convictions or righting their wrongs to make them better soldiers of the Empire, it was a job that was both cruel and horrible. Nearly killed when the Rebels blew up the shield generator on the forest moon of Endor, a disillusioned Sinjir stole the uniform of a dead Rebel soldier and promptly jumped ship. From planet to planet, Sinjir bounced from bar to bar until we meet him for the first time in a dive run by a one armed Mon Calamari in Myrra. He’s not the only one with connections with the Empire on Myrra. Also present are a handful of individuals who still hold significant power in the shattered entity that is the former Galactic Republic. The main force behind this meeting is Admiral Rae Sloane. She first appeared in A New Dawn, the first novel of the new expanded universe which debut almost a year ago. Then she was just an interim captain of a Star Destroyer, but that was before the Empire unveiled its first Death Star and time has apparently been kind to Sloane. Like herding a handful of quasi-evil cats, Sloane has managed to gather a self-styled Grand Moff, a renowned Imperial general, a former aid and follower of Emperor Palatine, and the richest benefactor to the Empire. Quickly noted is Sloane’s possession of not just a fleet of ships, but a second Super Star Destroyer, the Ravager. Not to be forgotten is a hero of the New Republic, Captain Wedge Antilles, one of the very few to fight and fly over both Death Stars. Captured in the very beginning of the book, Wedge spends much of his time between being tortured and unconscious trying to figure a way to escape. These are the pieces on Aftermath’s chess board, sometimes moving together and sometimes moving apart. Through circumstance and necessity, Norra, Temmin, Jas, and Sinjir find themselves brought together with a plan to capture or kill the Imperial bigwigs gathered in conference to decide the fate of the Empire. Between them are the clashing personalities of Norra and Temmin, a mother who wants to return to being a mother to a son, who still carries the pain of her absence when she left to join the Rebellion and to try and find his father, a Rebel sympathizer arrested years earlier by the Empire. Sinjir struggles to care, while Jas must deal with her inherent distrust of anyone other than herself. Each of the characters are fully realized and buoyed by past and present motivations. Aftermath is not a simple straight narrative, but written with interludes that present to the reader what is happening everywhere else in the background of the main story. Virtually every interlude travels to another planet with a constant theme of fall out. It’s a parade of almost continual Rebel triumph and a push to give the galaxy a government that exists as the opposite to the one they have and are in the process of dismantling. Here is a brief story of a battle raging between rebel troops and Imperial hold outs. Then here is a brief accounting of a moment in time on Cloud City, and there’s an introduction to the desert mining planet of Jakku. The interludes tease with references to some of our most well-known and beloved heroes, including one dedicated to Han and Chewie back in the Millennium Falcon. They’re both entertaining, but also frustrating, as they promise more of what might have been expected from the first post-Jedi novel than Aftermath actually does. A few of the interludes carry the whiff of being extremely short introductions to future novels and other media platforms. The Cloud City segment appears to directly lead into the smart phone game coming out soon, Star Wars: Uprising. Jakku is where the New Republic and the Empire had its last big battle, a level that will be playable in Star Wars: Battlefront and is the desert setting from The Force Awakens trailers. There’s evidence of a growing cult of Darth Vader and even a nod to Boba Fett’s possible fate on Tatooine. Characters are introduced with brief backgrounds, including one on Coruscant who enters the underworld intent on avenging the death of his father during a uprising against the Empire. Thus, the interludes exist as narrative hooks for future books and other media. Aftermath is written well, though Wendig has his own style which occasionally falls into a camp of being a bit lean and terse. In dramatic moments, he definitely favors allowing the reader’s imagination fill in the details, which is fine, but is slightly repetitive. 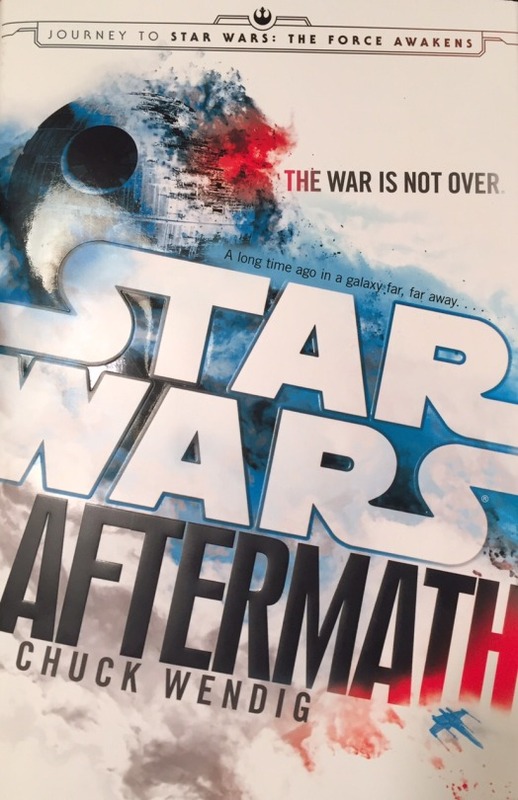 Aftermath is also the first in a trilogy, and while the story is satisfyingly concluded, it certainly sets up not just sequels but the gradually defined galaxy in which The Force Awakens is set. For those looking to ride along with Luke, Han, and Leia, it will be a disappointment. Their adventures remain a mystery yet. The adventures of Norra, Temmin, Sinjir, and Jas, however, are entertaining and fun to read. Perhaps the most fulfilling answer to “What happens after Jedi?” is the discussion among the Imperials, and through it we at least can gather the success of the New Republic and the collapse of the Empire. Aftermath is a fine entry into the new expanded universe, but its lack of focus on the characters we truly care about is a persistent disappointing reminder that it’s not quite the start of the Thrawn Trilogy some may have been wanting.